Tuvalu is a Polynesian island nation located in the Pacific Ocean, midway between Hawaii and Australia. The economy of Tuvalu is constrained by its remoteness and lack of economies of scale. Government revenues largely come from the lease of its highly fortuitous .tv Top Level Domain (TLD); sales of stamps and coins; fishing licenses (primarily paid under the South Pacific Tuna Treaty); direct grants from international donors (government donors as well as from the Asian Development Bank); and income from the Tuvalu Trust Fund (established in 1987 by the United Kingdom, Australia, New Zealand). The top exports of Tuvalu are non-fillet frozen fish, fish fillets, integrated circuits, fork-lifts and raw aluminium. The top export partners of Tuvalu are Thailand, Japan, South Korea, Australia and Italy. 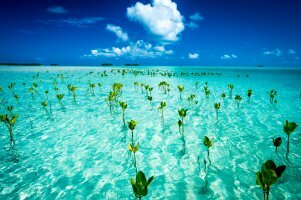 Tuvalu consists of a densely populated, scattered group of nine coral atolls with poor soil. Only eight of the atolls are inhabited. It is one of the smallest countries in the world, with its highest point at 4.6 meters above sea level. The country is isolated, almost entirely dependent on imports, particularly of food and fuel, and vulnerable to climate change and rising sea levels, which pose significant challenges to development. The public sector dominates economic activity. 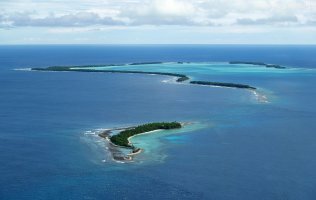 Tuvalu has few natural resources, except for its fisheries. Earnings from fish exports and fishing licenses for Tuvalu’s territorial waters are a significant source of government revenue. Tuvalu's top imports are tug boats, refined petroleum, iron structures, boat propellers and poultry meat. The top import partners of Tuvalu are Fiji, Japan, China, New Zealand and Australia. Tuvalu is a Polynesian island country located in the Pacific Ocean, midway between Hawaii and Australia. Its nearest neighbours are Kiribati, Nauru, Samoa and Fiji. Tuvalu is a member of the Pacific Island Countries Trade Agreement (PICTA) and the South Pacific Regional Trade and Economic Cooperation Agreement (SPARTECA). Since a single-line tariff was implemented, trade preferences are no longer granted to imports from Commonwealth countries. Tariffs, applying mostly to private imports, are levied as a source of revenue. Most duties are ad valorem, with specific duties on alcoholic beverages, tobacco, certain chemicals, petroleum, cinematographic film, and some other goods. No person shall export or attempt to export any warehoused goods, or goods liable to duties of customs transferred from an importing aircraft or ship, or goods entitled to drawback on exportation (not being wines, spirits, tobacco, cigars, cigarillos, or cigarettes), nor shall enter or attempt to enter any such goods for exportation in any ship of less burden than 35 tons, unless the Customs Officer shall otherwise allow. Base or counterfeit coin, or imitation currency or bank notes of any country. Articles of foods intended for human consumption declared by the competent sanitary authority to be unfit for such purpose. Indecent or obscene prints, paintings, photographs, books, cards, lithographic or other engravings or any other indecent or obscene articles. Infected cattle, sheep or other animals, or carcasses thereof, and hides, skins, horns, hoofs or any other part of cattle or other animals which may be prohibited by order of the Minister to prevent the introduction or spread of any communicable disease. Matches containing white or yellow phosphorus. All goods of foreign manufacture bearing any name or trade mark being or purporting to be the name or trade mark of any manufacturer, dealer or trader in Tuvalu or the United Kingdom , unless such trade name or trade mark is accompanied by a definite indication of the country in which the goods were made or produced. Prepared opium and pipes or other utensils for use in connection with the smoking of opium or the preparation of opium for smoking. Goods bearing the Royal Arms of Great Britain or arms so closely resembling the same as to be calculated to deceive unless the manufacturer of such goods holds Her Majesty’s authority to use them in connection with his trade, business, calling or profession. Shaving brushes manufactured in or exported from Japan, China, Hong Kong, India, Ceylon or the Philippines Islands, and all goods packed in the same inner container as such shaving brushes. Fictitious stamps and any die, plate, instrument or materials capable of making any such stamps. Imitation firearms so closely resembling firearms as to be calculated to deceive. Machines for playing games of chance, being games which require no action by any player other than the actuation or manipulation of the machine.